A free utility designed to copy/move files faster and more secure. TeraCopy is a free utility designed to copy/move files faster and more secure. Can resume broken file transfers. TeraCopy skips bad files during copy and even shows the skipped files at the end of files transfer. TeraCopy will calculate files CRC checksum on the fly to speed up source and target files comparsion. Seamless integration with Windows Explorer allows you to keep working with files as usual. Copy or move files using left mouse button drag or ‘Copy’ and ‘Paste’ commands. · Copy files faster. TeraCopy uses dynamically adjusted buffers to reduce seek times. Asynchronous copy speeds up file transfer between two physical hard drives. · Pause and resume transfers. Pause copy process at any time to free up system resources and continue with a single click. · Error recovery. In case of copy error, TeraCopy will try several times and in the worse case just skips the file, not terminating the entire transfer. · Interactive file list. TeraCopy shows failed file transfers and lets you fix the problem and recopy only problem files. · Shell integration. 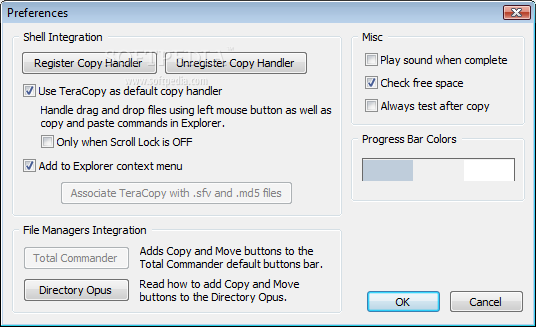 TeraCopy can completely replace Explorer copy and move functions, allowing you work with files as usual. What’s New in This Release: · Added: Better USB devices ejection. · Added: Option ‘CardReader’ to ini file. · Added: Option ‘ForceSameDriveMode’ to ini file. · Added: New language strings. · Fixed: Crush when testing md5 files. · Fixed: Always test target folder and request admin privileges if needed.